pads, pagodas, peacocks and urns. Each of the designs come in three different sizes and includes the squaring stitch as the first step. The 13 Sashiko Medallions are simpler than the quilting designs and look great when you are creating a traditional Sahiko style project. And the last 8 designs are the connecting Sashiko Designs, which are embroidered and then joined very closely to create a continuous pattern. 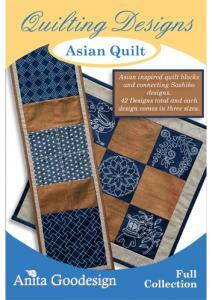 We created a table runner and a block quilt for our projects using navy and brown silk.